Every Sunday I slow-roast a chicken. I truss the bird, dress it with herbs, olive oil and a generous sprinkling of salt and set it on a bed of vegetables – whichever I happen to have on hand. 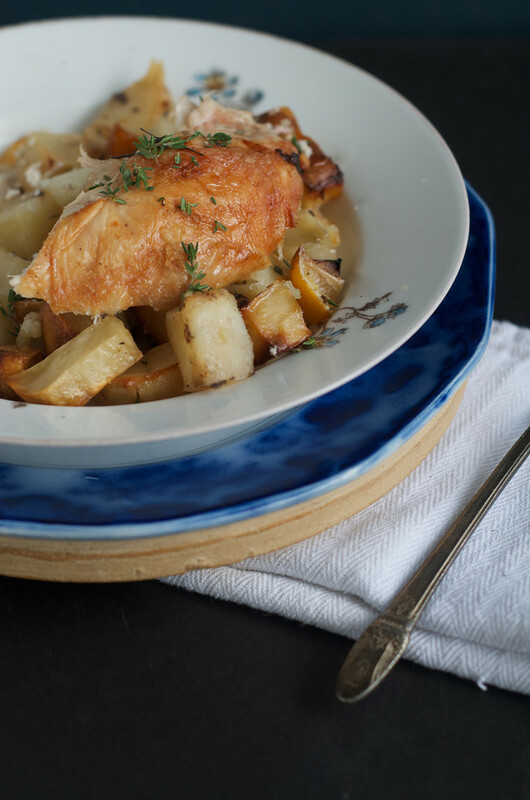 It’s a happy ritual, and one that helps to feed us all week long, and, later, when I toss the chicken’s frame into the my favorite slowcooker, that same meal gives us enough bone broth to last an entire week. Sundays are my busy day. It begins first with a big breakfast – sourdough pancakes, stewed strawberries, homemade yogurt, and is quickly followed by a trip to our farmers market. Later in the day, I prepare our foods for the week, adding more sweet tea to our continuous brew kombucha, setting up another batch of milk kefir and water kefir, feeding the sourdough starter. I plan our meals for the week. And then exhaustion sets in. It’s this time, that I line a clay baker with vegetables, truss a chicken, and begin an impossibly simple, no-fuss dinner. By the time my husband returns from his work with the farmers market, dinner is ready and we can enjoy the evening together. In the last several weeks, I lean heavily on a combination of the herb savory, coupled with garlic, potatoes, preserved lemons and ample olive oil. I like the pairing of chicken, potatoes and preserved lemon, having first tasted them in concert while doing volunteer work in Morocco one summer nearly 10 years ago. It’s there also that I first began experimenting with fermentation, learning how to preserve lemons and how to cure olives. Each winter when Meyer lemons first come into season, I buy one or two cases depending on the allowances in our budget, and preserve them the old-fashioned way: with salt and time. Fermentation softens the lemons’ natural tartness and also removes the bitterness from the lemon rind. 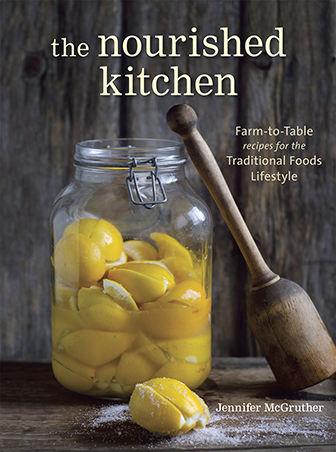 Within a few weeks to a month or so, the entire lemon ferments and becomes edible. It’s a distinct salty sour flavor that pairs nicely with both chicken and fish. You can learn how to preserve lemons with this tutorial. Whenever I write about roasting chickens or turkeys, I receive an inevitable onslaught of comments and emails that tell me I cook my birds far too long, and that any bird should be roasted at a very high temperature for only 45 minutes. I disagree, and, instead, I favor slow-roasting. In our home, I emphasize purchasing locally produced, pasture-raised poultry. Having enjoyed plenty of exercise, and having reached the time for slaughter at a much later age than conventionally raised birds, pasture-raised poultry tends toward toughness. These birds are much more flavorful than their industrially raised cousins, and slow-roasting tempers their natural toughness, producing remarkably tender and succulent results. Relatively low temperatures and extended cooking allows the bird to not only develop a distinct richness of flavor, but also it prevents the bird from staying tough and, instead, the meat loosens, and makes the birds easy to carve. I also salt my birds very generously. Salting the bird’s breast meat helps to draw moisture and fat from the skin, ensuring that it browns and crisps to perfection. If the flavor imparted by the salt becomes to strong for your liking, simply brush off any extra after the chicken has roasted and the skin has crisped. Rinse the chicken, inside and out, in a gentle stream of water. Pat it dry, then truss it with 100% cotton cooking twine (available here). Place the trussed chicken in a baking dish, and arrange the potatoes, garlic and lemons around the chicken. Brush the chicken with olive oil, and sprinkle it generously with sea salt and chopped savory. Drizzle any remaining olive oil over the potatoes, lemon and garlic. Roast, uncovered, at 275 F for 2 hours, increase the oven temperature to 375 F and continue roasting a further 45 minutes or until the skin of the chicken crisps and turns brown, and its juices run clear. Allow the chicken to rest for 10 minutes before slicing and serving. If you cannot find savory, substitute fresh thyme. This looks so good! Any chance you can make it with regular lemons? I don’t have preserved ones. Absolutely, but I wouldn’t eat the regular lemons – too bitter. I don’t know where you are located, but I’m curious how much your bird costs. I’m in NYC and a pastured bird that is just about 3 pounds is going for over $30. Would love to get a sense of comparison. Evelyn, if you can get to Brooklyn there’s an organic grassfed butcher, Fleisher’s. I shop at their upstate branch, everything I’ve tried has been fantastic. I believe whole chickens are $3.99lb(prices are listed on their site), at least up here-average chicken being between 3-4lbs. I pay $4 – $5/lb for a pasture-raised bird. in los angeles,we’re paying upwards of 30 dollars for a 3 lb bird. I love slow-roasting chickens too! I didn’t realize you could roast a chicken with veggies-that’s brilliant! I will definitely try it next time! I’m assuning that you would discard the inside of the lemons and just use the rind of the lemons…of do you use ghe entire preserved lemons. Do you rinse the salt off first? No. The recipe should be prepared, exactly as written. There’s no salt to rinse off of a properly preserved lemon, just as there’s no salt to rinse off of sauerkraut or a sour pickle. Is there a reason you use Real Salt of Celtic? Absolutely. These salts retain their trace mineral content unlike refined sea salt or iodized salt. Sorry that should have read Real Salt over (not of) Celtic? Oh! Yes! I choose Real Salt for basic cooking and fermentation and Celtic Sea Salt as a finishing salt. Expense is the reason. Your dish looks so delicious! I love using rosemary and thyme to season a chicken. I have never slow-roasted a chicken before, so I will give this a try. Thanks for sharing! Do you soak the clay pot? In the link it looks like one of the soaking kind. This sounds perfect for tomorrow night- except I will substitute sweet potatoes. I used to wash them too but am glad that now I don’t have too:) One less thing to do! Good grief!! I was really surprised that you recommended this article. I thought it was extremely offensive. Haha! Some people are so easily offended they really shouldn’t be on the internet. I love the response article you posted. To the point and very funny. Unfortunate some people give so much power to words that they can’t see the message! Delicious! I can’t wait to try this! Yea! I have some preserved lemons (your recipe). I do have a question about the olive oil. I used to cook with it all the time and now am seeing that I should only use it for salad dressings. Does the heating process of this low and slow method not make it oxidize like sautéing would? I’m wondering if there is an alternative to the 100% cotton kitchen twine… or where I could find it locally. I’ve never slow-roasted chicken before. I never really had the patience. But this post has convinced me to at least try it, and so I shall! Once the fall chill starts to creep into the air here in VT, I like to roast a locally raised chicken & root veggies from our garden on the weekend also. I like how this one comforting meal can turn into several more in the busier days to follow. I usually use leftover meat for a nice pot of chicken noodle soup & maybe in quesadillas. . Wondering how you use it later on in the week also. 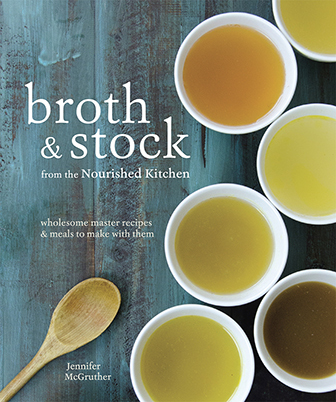 And please tell me more about how you make broth in your slow cooker- that’s one thing I need to learn to do more of! 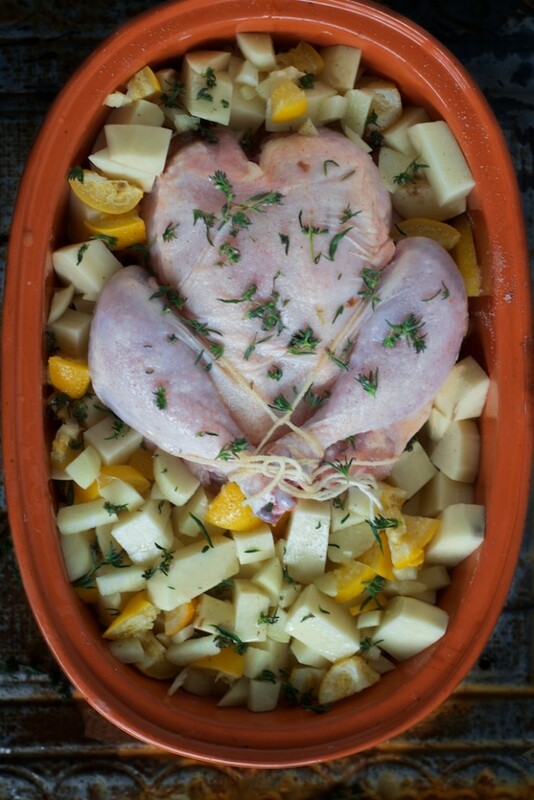 I love the photo of the chicken nesting on the vegetables ready to be put into the oven. Can you tell me what size and material baking dish you use to roast it? I made this for our traditional Sunday roast chicken tonight and it was fantastic! You are absolutely right that this is the best way to cook pastured birds. It made it as tender as the storebought organic birds I sometimes buy, but retained the delicious pastured bird flavor. I’ll never go back to the old way! That said, my preserved lemons are salty as the recipe I followed last year called for a lot more salt than yours does. Next winter I’ll try your recipe, but for now I’m accommodating their saltiness by using half the amount. The lemon flavor is still carries through since it is so intense. I see you haven’t commented here for awhile, so I can only hope that you’ll see my question and respond. For a couple of years, I’ve been salting birds a la Zuni Cafe method – afterwards we have cooked them in a variety of ways – spatchcocked and bricked on the grill (pretty good), roasted in a super hot oven (best taste – biggest mess), spatchcocked in the oven (good – still a bit messy – even if you have a self-cleaning oven), rotisserie (routinely good)…. but it’s only been recently that I’ve started buying pastured birds exclusively. From your recipe, it sounds like the extra salt, pre-roast – is akin to the 2 day salting method – which lead me to wonder if you’d ever tried salting a pastured bird for a couple of days before roasting it. I haven’t tried the clay pot method, but am going to do so in the next day or so. I was trying to decide whether to salt the bird today and cook it in a couple of days, or whether to just go ahead and cook according to your directions…..so it got me thinking about the effects of salting what might be a tougher bird. I’ll probably have to experiment and try salting your way and Zuni Cafe way…but I just wondered if you or anyone else had any experience with this. I’m also committed to Judy Rogers’ salting methods. Last time I did chicken on beer can. Slow roasted sounds good. Have you tried Judy’s salting method with the slow roasting technique? just the potatoes. open roasting carrots and the long sweet whitish root veggie just didn’t work out for them. they got dried out,tough and not fun to eat. but the rest of this was gorgeous! thank you for a full proof roasted chicken recipe. This was so easy to prepare and so delicious! My new favorite way to roast chicken. I used thyme because it’s what I had on hand, and I also substituted sliced black radish, turnip, carrot and red onion for the potato. They didn’t get dried out (not sure if previous reviewer drizzled her root veggies with olive oil — that did the trick for me, but you could also stir them partway through cooking to make sure they’re coated). The recipe turned out to be very flexible, and the whole house smelled amazing. do you turn the chicken over during cooking? Nope. I prepare it exactly as the recipe is written. Love this blog post. My mom used to cook chicken in a clay pot when I was a kid. I agree lemon, potato and chicken is a great combination. I can’t wait to try your approach. 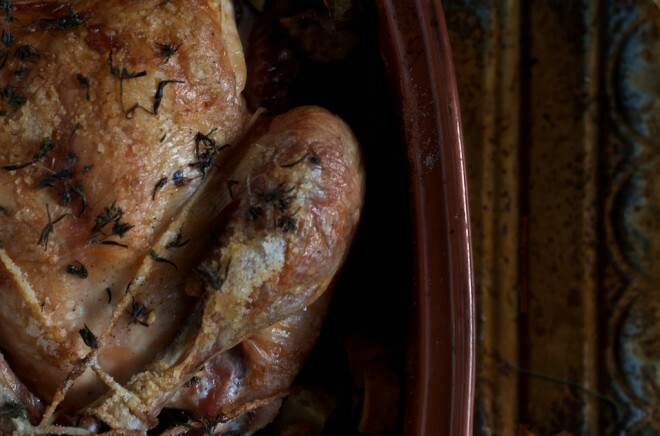 Have you ever tried using a tagine for roasting the chicken? I think I may try your recipe in a tagine. Could be great! Hi I was wondering if you could help me find the broken link for your “feed my family all week” statement. While I like roasting chickens and I love having the broth, my family and I get bored with it. Any thoughts as to how to use chicken meat in creative ways? Thanks I love your blog!